Firstly, I would like to thank O-HI! Hong Kong agent for sending this product to me. It came at a right time as my previous cleansing water almost empty. It is a 500 ml big bottle of cleansing water which made the parcel quite heavy. The price of it is HKD $118 for this one big bottle. The texture is very watery and it's transparent in color which make it looks like water. To use it, you may pour out the cleansing water onto the cotton puff and wipe off your makeup. To further show the effects of the cleansing water, I tried to remove different makeup products by using it. 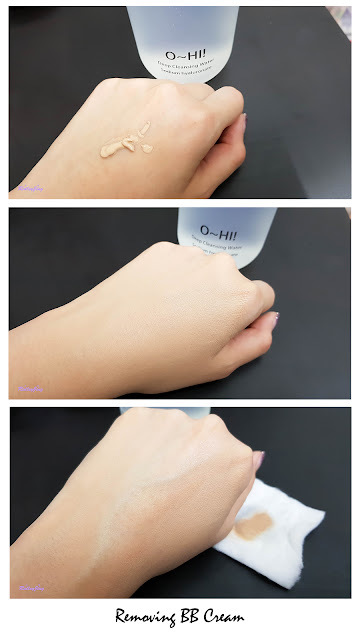 I tried to wipe off the BB cream I put on the back of my hand, it wiped off the BB Cushion at the 1st wipe. 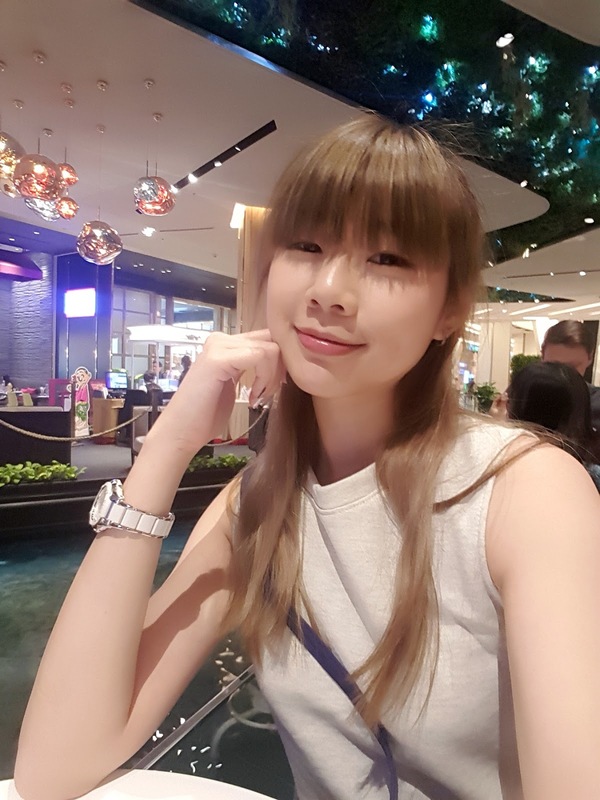 The result was good as it really cleansed the products very well in a short time. It does not has a sticky texture which is a plus point for it and my skin actually felt moisturizing after using it. Next, I tried to use it to remove the eyeshadow, eyebrow, liquid eyeliner (waterproof) and gel eyeliner (waterproof). 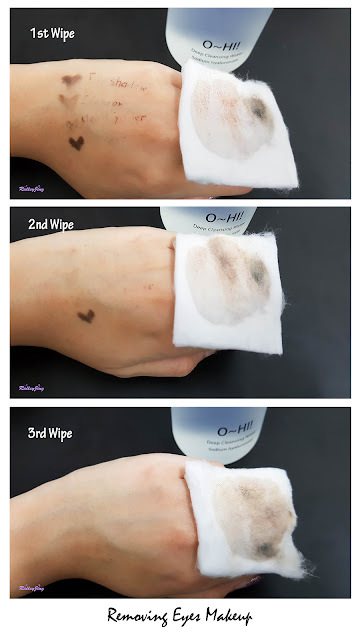 If you are removing your eyes makeup with the cleansing water, it is recommended to pour the product onto the cotton puff and put in on your makeup for 10 seconds before you wipe off your makeup. The result was good. 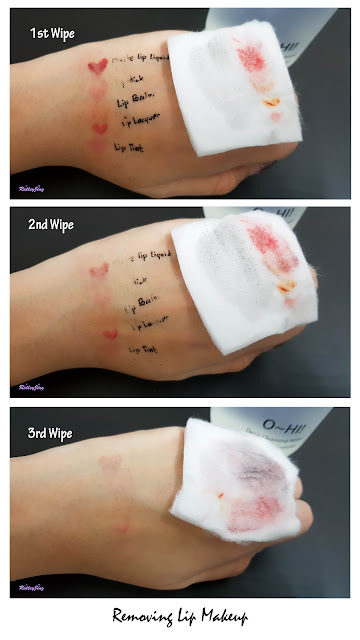 As you can see in the photo, during the 1st wipe, half of the makeup products gone. During the second wipe, most of the products gone except the gel eyeliner. 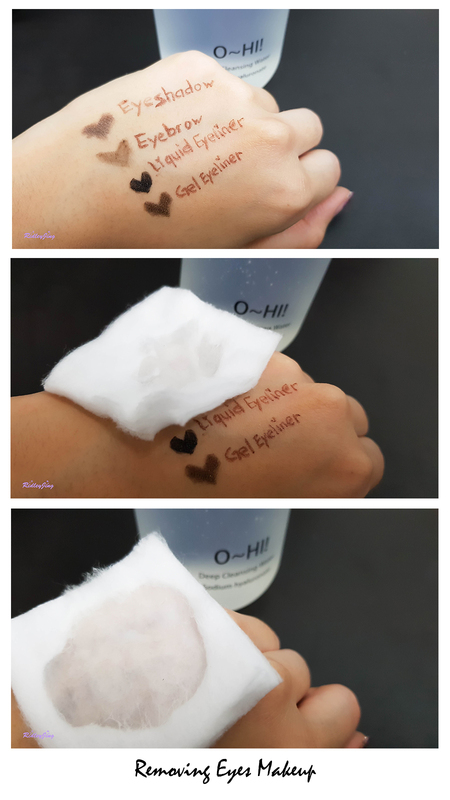 Therefore during the third wipe, I try to put the cotton puff onto the gel eyeliner for another few seconds and then wipe it off again. As you can see, it was wiped off cleanly. Next, I will try to cleanse off my lip products. By repeating the same steps, I will try it on the matte lip liquid, lipstick., lip balm, lip lacquer and lip tint. As you can see in the photo, during the first wipe, half of the products were gone. During the second wipe most of the products were gone except matte lip liquid and lip lacquer. During the third wipe, I tried to put the cotton puff on it for another few seconds and wipe it off. 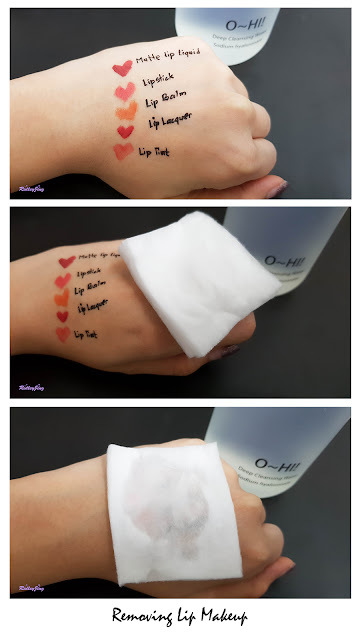 Most of the lip products were gone except the matte lip liquid and lip tint, which still left a little bit of traces on my hand. 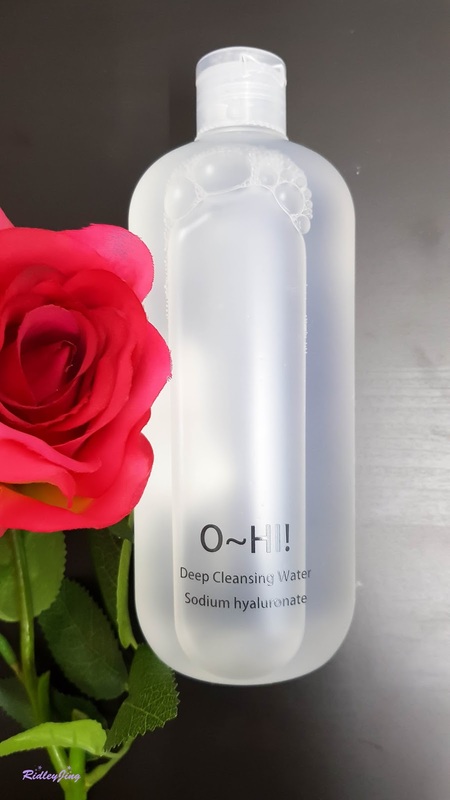 It came in a big bottle which is very good because I used cleansing water almost everyday to remove my makeup. 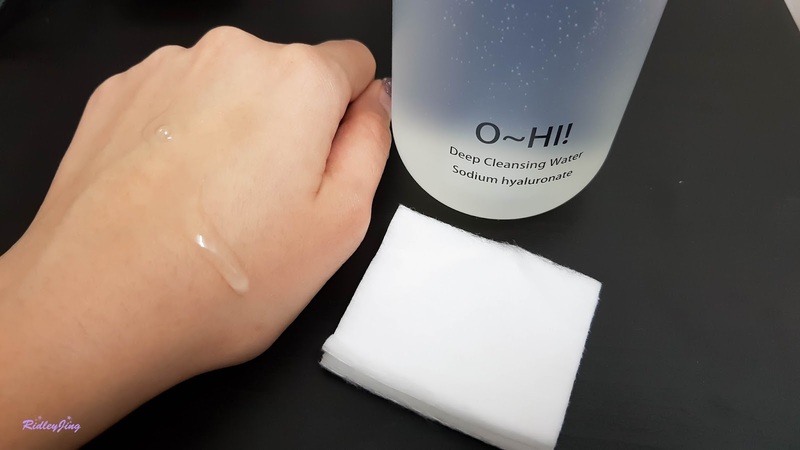 The texture was very watery and it really did a good job in removing most of the makeup products. The plus point of it is, it did not make my skin feels dry but it actually moisturizes my skin instead. Just remember to wash it off after you used it. Although it does not feel sticky, but it does give a little bit of greasy feel actually.